This is an adapted book for use with young children or those with special needs. 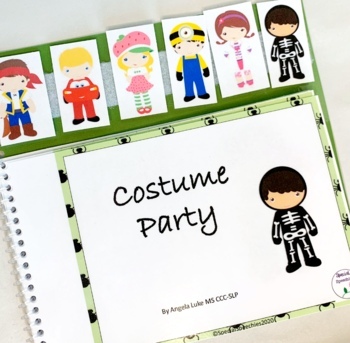 It has predicable lines for repeated readings and can be used at Halloween or any time as little ones often like to play dress up. 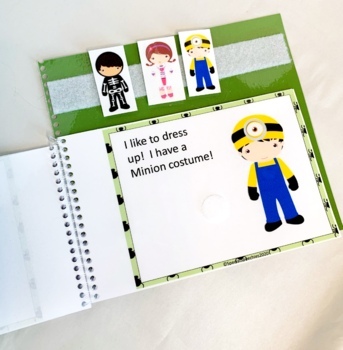 There are smaller characters from the story to use in matching to the larger ones if you velcro on the pages, it makes a good literacy activity for some of our special needs population. 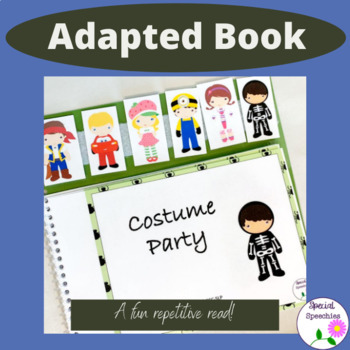 Examples of ways to use this book include targeting the concepts of big, little, and same, general costume vocabulary, and print concepts of reading top to bottom and left to right. This book can be used with an individual child or in a small group. You can adapt as needed for each child's needs. For example, a child may need fewer characters to choose from for matching so you can begin with two and increase difficulty as needed. As a speech language pathologist, I use these types of books regularly and I hope you enjoy this sample. There will be more to come! !